We are proud to announce the formation of the European OHDSI Chapter led by Erasmus University Medical Center The Netherlands. We like to strengthen the European contribution to the global OHDSI community. Europe should contribute in tool development and also of course participate in large global studies that have not been possible before. Furthermore, we need to educate all the stakeholder to guarantee high quality in data transformation and usages. 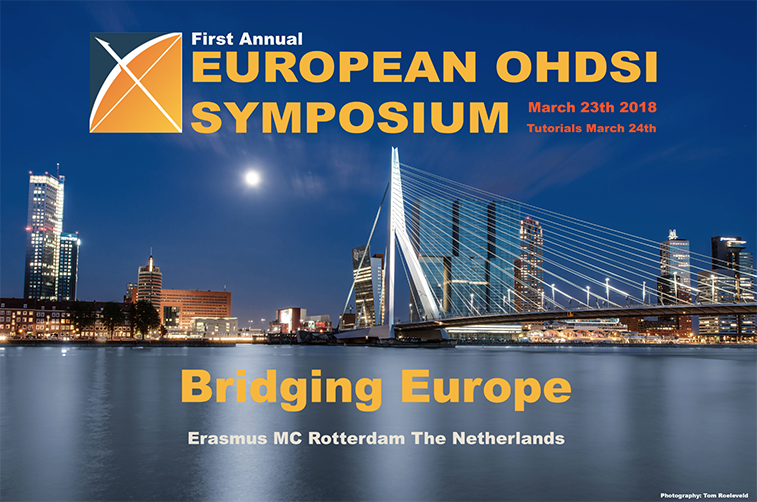 The annual OHDSI symposium is a perfect instrument to gain momentum, inform, and enlarge the European OHDSI community. The first annual symposium will take place March 23th in Rotterdam and tutorials will be offered on March 24th. 9:10 – 9:40am The Journey of OHDSI: Where have we been? 9:40 – 10:10am The European OHDSI Initiative: Why are we here? 10:10 – 10:40am The Journey of OHDSI: Where can we go together? 3:45 – 4:45pm Expert Panel: Adoption of the OMOP-CDM in Europe opportunities and challenges. Please note that registration for tutorials is separate from the main symposium registration.